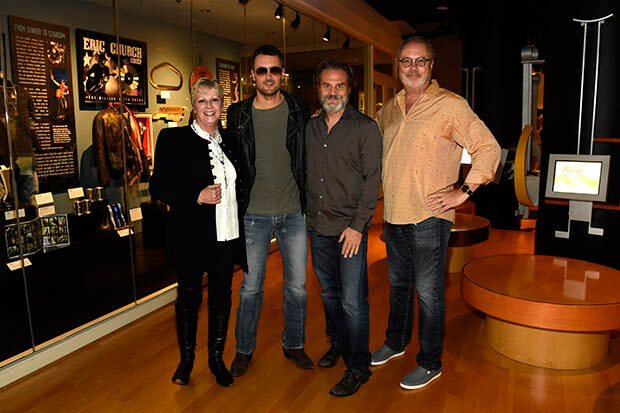 Nashville, Tenn. – (Nov. 18, 2015) – The Country Music Hall of Fame and Museum hosted an intimate reception of family, music industry friends, and media VIPs last night to celebrate the opening of its latest cameo exhibition, “Eric Church: Inside the Outsider.” The exhibit features stage clothing, song manuscripts, photos, awards, a hand-written note from George Strait, and more memorabilia that was personally selected by this year’s top CMA Awards nominee for the display. “Eric Church: Inside the Outsider” will run through February 2016 and is part of the normal admission to the Country Music Hall of Fame and Museum. The Country Music Association and four-time Academy of Country Music Award winner finished 2014 as country music’s top-selling artist, with the year’s highest debut and sales of any release in the format as the critical and commercial success The Outsiders reached Platinum status, marking more than one million albums sold. Debuting at No. 1 on both the Billboard Top 200 Albums Chart and Top Country Albums chart, “The Outsiders” garnered GRAMMY, CMA and ACM Album of the Year nominations and features his No.1 hits “Give Me Back My Hometown” and “Talladega” as well as Top 10 “Like A Wrecking Ball.” The Outsiders is the follow-up to Church’s Platinum-certified CHIEF, named the 2012 Album of the Year by both CMA and ACM, and GRAMMY-nominated for Best Country Album. The LP featured five Top 20 singles: “Homeboy” (certified Platinum for sales in excess of 1 million); the Top 10 “Like Jesus Does” and the Top 5 “Creepin’” (both certified Gold for sales in excess of 500,000); and two No. 1 hits “Drink in My Hand” (certified Platinum) and “Springsteen” (certified Double Platinum for sales in excess of 2 million singles). Church’s 2006 debut album, Sinners Like Me (2006) and his sophomore album Carolina (2009) are both RIAA Gold-certified. For more information or tickets, visit www.EricChurch.com. Accredited by the American Alliance of Museums, the Country Music Hall of Fame® and Museum is operated by the Country Music Foundation, a not-for-profit 501(c)(3) educational organization chartered by the state of Tennessee in 1964. The museum’s mission is the preservation of the history of country and related vernacular music rooted in southern culture. With the same educational mission, the foundation also operates Historic RCA Studio B, Hatch Show PrintTM CMF Records, the museum’s Frist Library and Archive and CMF Press. Museum programs are made possible, in part, by the Metropolitan Nashville Arts Commission, the Tennessee Arts Commission, and under agreements with the National Endowment for the Arts.